The CTP-3 CoolTube™, the first and only onboard tube preamp for acoustic guitar, produces a rich, full sound. It takes its name from innovative Takamine™ technology that runs its 12AU7 dual-triode vacuum tube at very low voltages—so low that it stays cool to the touch—with variable tube tone that can be adjusted from bright and brilliant to thick and warm. The CT4B II Preamp is designed for use only in Pro Series Takamine guitars made in Japan. It is not compatible with G Series guitars and electronics. The Takamine line driver preamp (TLD-2) is a simple circuit designed to buffer the pickup and boost the current of the signal to eliminate any degradation with long cables. 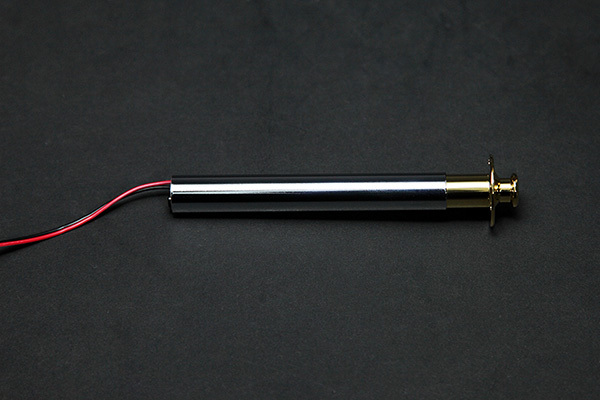 It is clean and quiet with a minimal amount of wiring and is discreetly mounted within the output jack assembly providing no outward sign of on-board electronics. The TLD-2 does have 3 simple tone shaping controls if you care to extract and tinker. But you are likely to find the preset TLD-2, combined with our renowned Palathetic pickup, as Takamine’s warmest and most natural acoustic – electric tone yet - and that’s saying something. 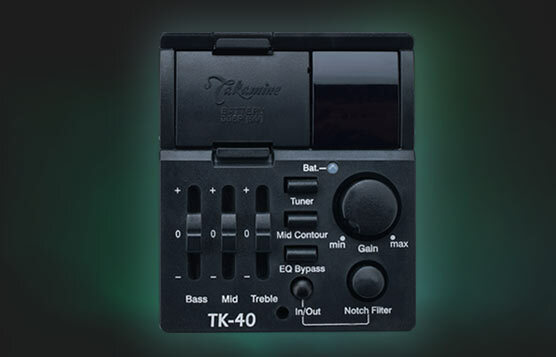 Also available, the Takamine TK-40D preamp is a double pickup version of the TK-40 preamp. This version has two pickup elements to accommodate each piece of the split saddle bridge design on specific G Series guitars. Notch Filter: A Notch Filter is a very special kind of EQ, an extremely narrow and deep cut of an audio frequency band. The TK-40 has a "tunable" notch filter which empowers the user to select the specific frequency band that will be affected by the notch. 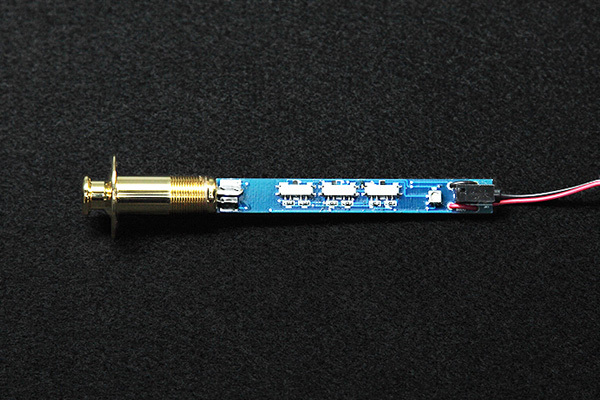 With this tunable notch filter the user can "surgically" remove troublesome feedback frequencies that occur due to the natural resonance of the guitar and interaction with the environment. The notch control provides control of the center frequency of the notch effect. When the monitor or stage levels are too high, and the user hears the guitar starting to feed back, the player can engage the notch circuitry by pushing the "In/Out" button under the "Notch Filter" knob, and simply tune the filter (actually changing the center frequency of the notch) by slowly rotating the notch control until the feedback is eliminated. Mid Contour: By pushing (activating) the Mid Contour button, the user is selecting a pre-shape EQ that emphasizes the frequencies normally found to be "desirable" in an acoustic guitar (400 Hz). With the Mid Contour button is depressed, the mid EQ is effectively controlling "nasal" tone qualities while in the up position, the mid control can add punch in upper mids or help "round off" the attack present in this frequency spectrum. The user should experiment with the button and the "Middle" control to determine their sound preference. Tuner: The tuner in the TK-40 is fully chromatic and automatic. The battery drops into the top of the preamp under the battery cover. There are "+" and "-" markings at the bottom of the compartment. Press the tuner switch to activate it. The note played is shown in the digital display. Up and down arrows will appear, when both are on and not flashing, the note is in tune. If the "up" arrow is flashing the string must be tuned higher, and if the "down" arrow is flashing the string must be tuned lower. The slower the arrow flashes, the closer the string is to being in tune to the note displayed. The tuner does not mute the output and turns off automatically after one minute. It can't be turned off manually. The TP-4T preamp is designed for use only in G Series model guitars and are not compatible with Pro Series Takamine guitars made in Japan. 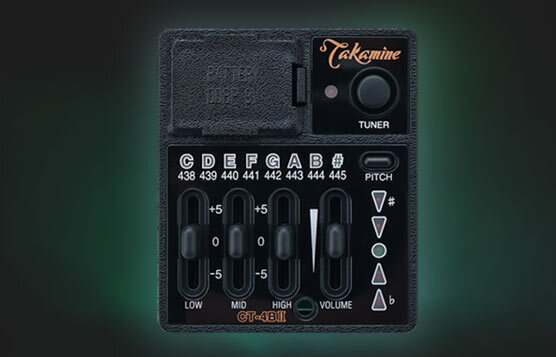 The Takamine TP-4T preamp found on G Series guitars features a gain knob, a tuner, an active shelving system EQ with bass, middle, and treble frequency slider controls, and a low battery light. The preamp is switched on by plugging a standard mono instrument cable into the endpin/strap pin jack. Unplugging the cable switches the preamplifier off. The TP-4T Preamplifier is powered by a single 9 volt battery. 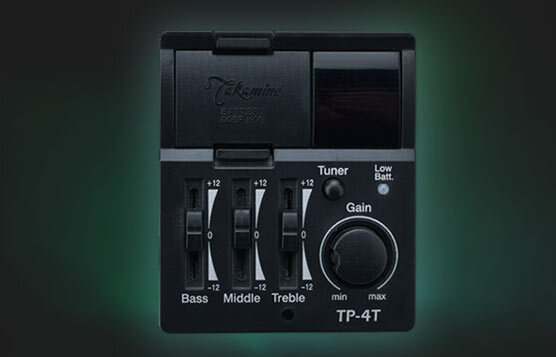 Also available, the Takamine TP-4TD preamp is a double pickup version of the TP-4T preamp. This version has two pickup elements to accommodate each piece of the split saddle bridge design on specific G Series guitars. This preamp features a gain knob, a tuner, an active shelving system EQ with bass, middle, and treble frequency slider controls, and a low battery light. 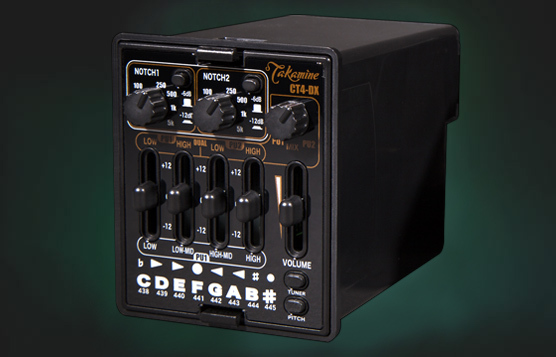 The Takamine TP-E preamp is an easy way to get great amplified acoustic sound. Found exclusively on Takamine G-Series models, the TP-E features a simple, easy-to-use control layout that allows you to quickly dial in great sound, so you can concentrate on the most important part of your gig – the performance. On the control panel you’ll find a Gain control, master Tone control, a Mid-Cut switch, and a built-in chromatic tuner. The Gain knob controls the overall volume of the preamp. 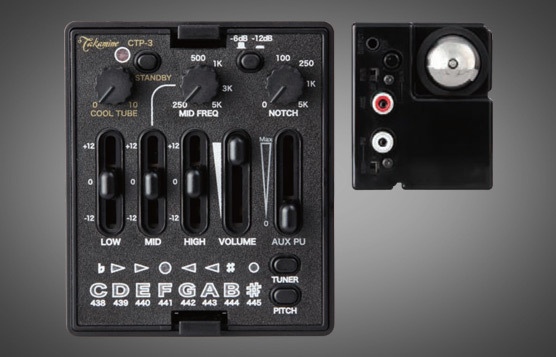 The Tone knob controls the overall tonality of the sound, while the Mid-Cut switch allows you to reduce the mid frequencies for the popular “scooped-mid” sound. 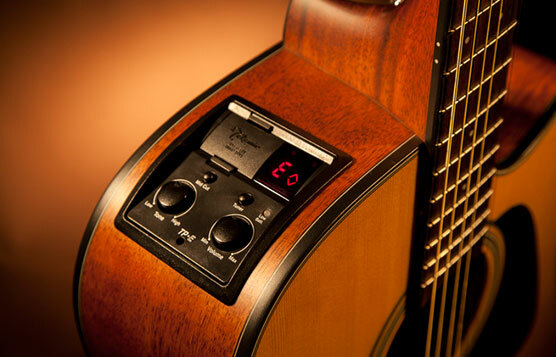 The onboard electronic tuner ensures you’re always in tune and ready for the next song. To release the preamp from the preamp frame. First, to release the preamp from the preamp frame, you must depress the two clips located on the inner wall of the preamp frame. This is done by inserting a sturdy paperclip through the preamp slots as shown on the illustration. The clips are plastic and should release easily. Do not use excessive force as too much pressure can break the clips. Once released from the frame, slide the preamp out of the guitar body. Disconnect plugs attached to the jacks on backside of the preamp. Note: to avoid damage to the wiring, do not pull the plugs out by the wire. Instead remove by grasping the plastic plug body. Install the plugs into the new preamp jacks. Takamine preamps use two different types of plugs for input and output - so an incorrect connection cannot be made. When installing the new preamp, position it so that the battery compartment on the preamp is located on the side closest to the guitar neck. Slide the new preamp down into the preamp frame, until it snaps into the frame clips. Install battery and you are ready to play. The Cool Tube and CT4B II preamps are both designed for use only in Pro Series Takamine guitars made in Japan. These are not compatible with G Series guitars and electronics. The TK-40 and TP-4T preamps are both designed for use only in G Series model guitars and are not compatible with Pro Series Takamine guitars made in Japan.